The Kimeltuwe initiative is an online space for teaching and learning the Mapuche language (also called “Mapudungun” or “Mapuzungun”), which started out as the Twitter account @frasemapuzungun (Mapuzungun phrases), created by Mapuche primary education teacher Victor Carilaf in collaboration with the Chilean illustrator and Mapudungun language student Fiestóforo. The Kimeltuwe project is a nonprofit initiative that formally launched in April 2015, but first began with previous collaborations between its authors in October 2014. These days, publications related to the initiative are officially distributed through three social media accounts: One on Facebook, one on Twitter, and a Youtube channel. Reactions to the work of Kimeltuwe stem from both native Mapuzungun speakers and non-native learners, as well as those who are teaching it. It has been a valued resource for educators as complementary material in the classroom. As such, Kimeltuwe has become a source of consultation and feedback for language students in Chile and around the world. These mainly consist of people who live in urban areas. In rural areas, it is teachers who have shown the most interest, by printing materials or projecting them in the classroom and displaying their appreciation by means of photos sent to social media networks. Software used: Movie Maker (video editing), Inkscape (graphics editing), GIMP (graphics editing), Openshot (video editing), Synfig (graphics and animation editing), Audacity (audio editing). Kimultuwe's material content is diverse and includes songs, poems, and phrases. For example, lyrics of songs by John Lennon and Violeta Parra, poems by Pablo Neruda, and passages from The Little Prince have all been translated into Mapuzungun. This kind of content was generated for distribution due to wide recognition, regardless of whether or not they are of Mapuche origin, as they help demonstrate the versatility of Mapuzungun. This practice is also a good way to publish material on networks without having to constantly generate original material (created by an ex-professor from language research work), as new works are being reserved for publication in the near future. As part of this strategy, they have also decided on occasion to publish songs or paintings by local artists. ‘sabe que hoy día mi niña me dijo pun may que son las buenas noches y lo dijo gracias a ustedes porque ustedes lo han publicado y mi niña aprendió ahí’. ‘Yo me he acordado de una palabra’. ‘Yo no sabía y luego aprendí esto’. ‘mire yo aprendí o tengo los conocimiento mínimos al menos, gracias a la página, porque yo visito la página y por eso supe esta palabra y por eso me lo sé’. Some of the more important challenges Kimeltuwe faces involve finding diversity in content. Observers note that some subjects are more popular than others, like publications that focus on aspects of daily life (how to wish a good day to someone, for example, or good night, has had the highest success among social media, in comparison with more grammar-based lessons). Following this sense, an introduction of content promoting the wisdom and knowledge of Mapuche has also been proposed, as it has been observed that they share equal popularity. These are cultural elements not shared by other Chileans (or Argentines); for example, food, baby names, furniture, childrearing techniques and musical instruments, among others. 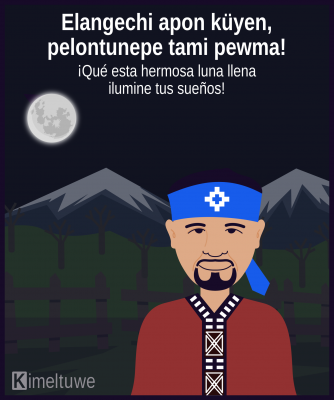 Recognizing that these kinds of content have gained a larger acceptance, the Kimeltuwe team mixes them with other content about the Mapuche language in a more grammatical manner. Bringing Kimeltuwe-produced work to rural environments is an important challenge for populations where Mapuzungun “is lived every day,” as a strategy that emphasizes the necessity of continuing to transmit the language to new generations. Although goals have not been established in terms of audience numbers that the Kimultuwe project wants to reach, its creators want their materials serve the largest number of users and have a better positioning in schools as well as social networks. That is why one of its short term goals is to secure funding for the printed publication of books, posters and sheets that can be distributed in schools. El internet me da esa opción porque yo puedo conocer a personas que viven en la costa, cerca del mar, y dicen: ‘mire, aquí se habla así’, y conocer a gente que está en Argentina y ‘aquí hablan así’. No necesito ir a esos lugares porque tengo un lugar donde puedo obtener esa información. The internet gives me that option because I can meet people that live on the coast, by the sea, and say: ‘Look, they're speaking it like this here,’ and meet people in Argentina and go, ‘Here they speak it like that.’ I do not need to go to those places because I have a place where I can obtain that information. Por eso dije [al ver lo que se comparte en las redes]: también esto se puede hacer en mapuzungun, ¿por qué no? Si a la gente le gusta, ¿por qué no lo ‘mapuchizamos’? Nuestra idea está como en eso, [en] ‘mapuchizar’ las redes sociales, ya sea Twitter, ya sea Facebook, sea YouTube. En YouTube quizás existe más material. Pero por ejemplo, no es así en Twitter porque al menos aquí en Chile tener Twitter es para gente, digamos, de otro nivel mediático. A esa gente también hemos alcanzado de alguna forma. Hemos creado conciencia de la lengua, que todavía existe, [aún] que mucha gente dice que ya no. Gente que nunca ha tenido relación con nosotros [los mapuches] dice que no. Entonces también es eso, ‘mapuchizar’, si podemos subir una imagen, como las que subimos, y eso se pueda retuitear, se pueda difundir, genial para nosotros. Esa es en el fondo la idea. That's why I said [seeing what is shared on social media]: This can be made into Mapuzungun too, why not? If people like it, why don't we “Mapuchize” it? Our idea is, [to] ‘Mapuchize’ social networks, be it Twitter, Facebook, or Youtube. Youtube may have more material. But that is not the case with Twitter, for example, because at least here in Chile people who have Twitter are, as we say, on another level media-wise. But we have also reached these people in some way. We have created awareness of the language, which still exists, [even] though many people say it won't for much longer. People who have never had relationships with us [the Mapuches] say so. But then there is also that, the concept of ‘Mapuchizing,” if we can upload an image and it's retweeted, it can spread, which is brilliant for us. That is the bottom line of the idea.